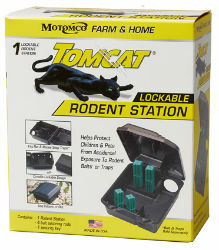 Tomcat Bait Stations provide security by keeping bait out of reach of children, pets, livestock, and non-target animals. They increase the effectiveness of any bait by protecting it from the elements and providing a sheltered area where rodents feel comfortable feeding. The Tomcat Rodent Station is an excellent value for customers looking to upgrade to the security of a tamper-resistant bait station. It locks when closed and is unlocked with a special 2-pronged key. It's small footprint can be used in many different areas, but is large enough to hold up to 8 x 1 oz. Bait Chunx or a Tomcat Rat Trap. For mice or rats.